Would You Ride An Attraction With Your Hands Bound Together? Theme parks are always looking for a way to ramp up simulated terror. Many use live actors, sneaky special effects or loud startles. However, Fuji-Q Highland in Japan is taking things to a new level: bounding riders hands together. According to a recent news story in Japan, this new attraction will “lightly” bound riders hands together before boarding. As the backstory goes of the new “Endless Mine” ride goes, riches and wealth were left in an abandoned mine shaft. As various people tried to rob the mine, they were met with an untimely demise. Riders in the new attraction enter a mine car with their hands bound together, but that’s not all. Guests will be wearing headphones giving 3D surround sound effects. According to the release, there are “staff” also on board the vehicle for safety purposes. I’m also betting that those staff may also do a little spooking of their own. The mine cart ride vehicle also has a few tricks onboard as well. Apparently it features “robot technology” that allows it to accelerate, slow down and stop while reading reflective tape placed strategically around the track. What do you think? Is bounding your hands going too far to “scare” theme park riders? Do you think other parks will follow suit? 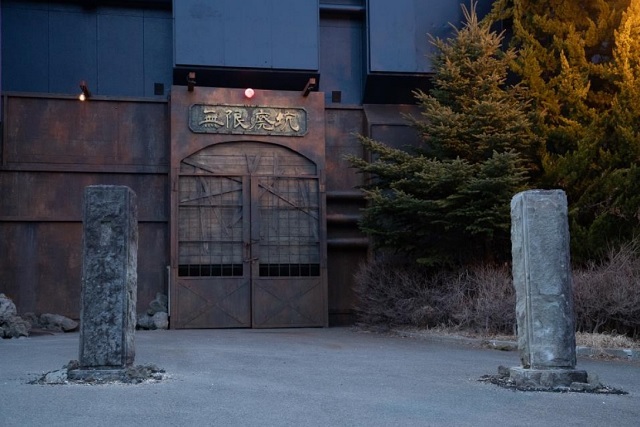 This entry was posted in Haunts and tagged Fugi-Q Highland, Hands bound dark ride, Haunted Dark Ride, Japan. Bookmark the permalink. Trackbacks are closed, but you can post a comment.